I hid this secret for years because I still suffer episodes of harming myself when I’m deeply hurt or severely depressed. It’s a coping mechanism that I sometimes cannot control. My emotional pain becomes so overwhelming that I slap myself as hard as I can several times across my face or bang my head. Physical pain is the one thing that distracts me from despair. Each whack breaks me away from my tortured mind. Death had become a desire, and suicide beckoned me all the time. But I was afraid to kill myself—and I didn’t know why. What was holding me back? This drove me crazy. My life held no hope, my humanity was annihilated, yet some inexplicable force prevented me from killing myself. 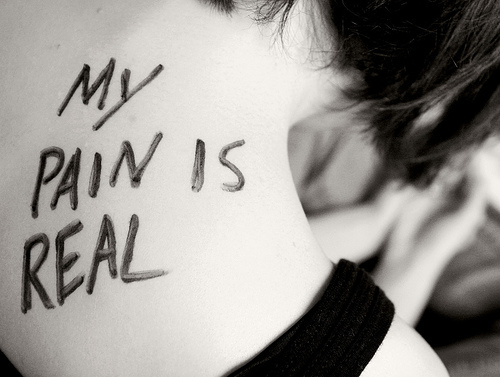 Because my illness is a constant reminder of past horrors and I suffer endless physical pain, the urges still come. I now work through my depressions by listening to uplifting or sad songs and resting in the one who strengthens me and fills me an inexplicable joy. I’m a very weak woman who has put her trust in a very strong God. And when I feel the need to hurt myself, I stop, ponder, and take a breath. Also, thankfully, I have a loving support team, something I’ve never had in my life before. It’s been about a year since I’ve hurt myself. For me, that’s real progress. And, somehow, I can wear a smile. Self-injury is an important issue. So many suffer silently. 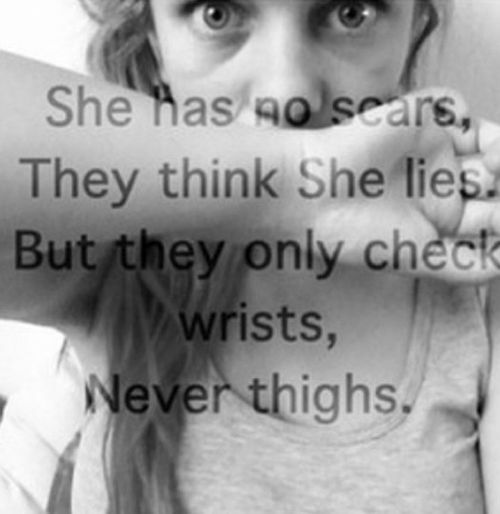 hiding their scars and pain. “Razors were in my parents’ bathroom. I sneaked in and took one of my father’s double-edge razor blades out of the plastic sleeve. Then I ran back to the hall bathroom and shut the door. My eyes fix on the edges of the blade. I held it nervously over my upturned left wrist. A few minutes pass. I pretended my daddy would miss me when I made the first cut across a large vein. Such a small piece of metal. I pressed the blade into my skin. Bright red blood oozed out. Dazed by what I did, I stared. 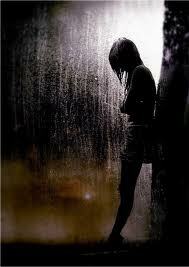 The thick stream trickled down the palm of my hand and over my fingers, dripping slowly onto my mother’s spotless floor. Will this mean no more birthday parties? No more kickball? Mom’s going to be mad about the blood on her clean floor. Hypnotized, I sliced a second vein on the same wrist. The blood poured out faster this time. Mommy, remember when we played catch in the backyard? A third slash. A fourth. I slipped into a daze, and my right hand kept cutting, as if acting on its own, taken over by some other power. Puddles of blood grew wider and saturated my jeans. Can the washing machine remove the blood from them? The razor dangled, stuck inside the last cut.